Italian physician and medical author; born at Verona June 21, 1802; died at Venice Dec. 2, 1877. Asson's father dying while his son was still an infant, the family was left in such straitened circumstances that an uncle undertook Asson's education. The latter attended the academy of his native town and the universities of Padua and Pavia, taking a postgraduate course at Milan. 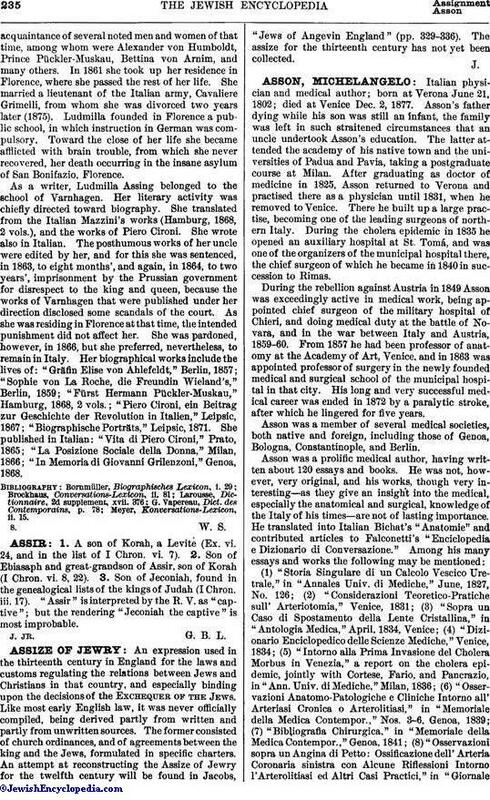 After graduating as doctor of medicine in 1825, Asson returned to Verona and practised there as a physician until 1831, when he removed to Venice. There he built up a large practise, becoming one of the leading surgeons of northern Italy. During the cholera epidemic in 1835 he opened an auxiliary hospital at St. Tomá, and was one of the organizers of the municipal hospital there, the chief surgeon of which he became in 1840 in succession to Rimas. During the rebellion against Austria in 1849 Asson was exceedingly active in medical work, being appointed chief surgeon of the military hospital of Chieri, and doing medical duty at the battle of Novara, and in the war between Italy and Austria, 1859-60. From 1857 he had been professor of anatomy at the Academy of Art, Venice, and in 1863 was appointed professor of surgery in the newly founded medical and surgical school of the municipal hospital in that city. His long and very successful medical career was ended in 1872 by a paralytic stroke, after which he lingered for five years. Asson was a member of several medical societies, both native and foreign, including those of Genoa, Bologna, Constantinople, and Berlin. (1) "Storia Singulare di un Calcolo Vescico Uretrale," in "Annales Univ. 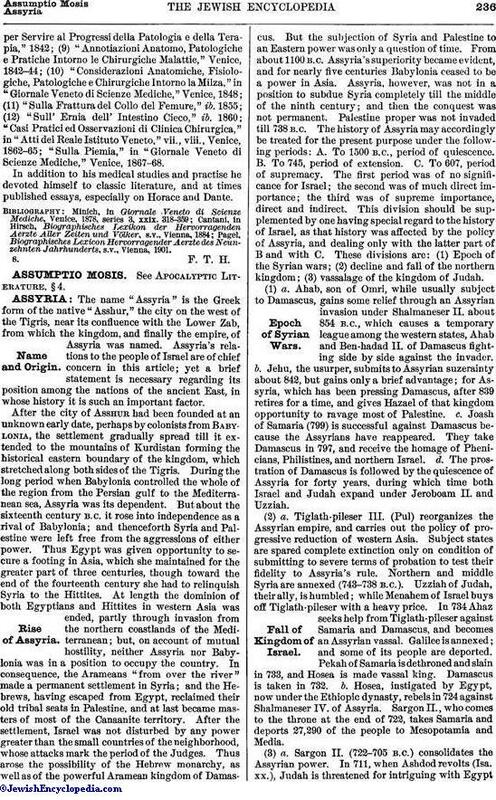 di Mediche," June, 1827, No. 126; (2) "Considerazioni Teoretico-Pratiche sull' Arteriotomia," Venice, 1831; (3) "Sopra un Caso di Spostamento della Lente Cristallina," in "Antologia Medica," April, 1834, Venice; (4) "Dizionario Enciclopedico delle Scienze Mediche," Venice, 1834; (5) "Intorno alla Prima Invasione del Cholera Morbus in Venezia," a report on the cholera epidemic, jointly with Cortese, Fario, and Pancrazio, in "Ann. Univ. di Mediche," Milan, 1836; (6) "Osservazioni Anatomo-Patologiche e Cliniche Intorno all' Arteriasi Cronica o Arterolitiasi," in "Memoriale della Medica Contempor.," Nos. 3-6, Genoa, 1839; (7) "Bibliografia Chirurgica," in "Memoriale della Medica Contempor.," Genoa, 1841; (8) "Osservazioni sopra un Angina di Petto: Ossificazione dell' Arteria Coronaria sinistra con Alcune Riflessioni Intorno l'Arterolitiasi ed Altri Casi Practici," in "Giornaleper Servire al Progressi della Patologia e della Terapia," 1842; (9) "Annotiazioni Anatomo, Patologiche e Pratiche Intorno le Chirurgiche Malattie," Venice, 1842-44; (10) "Considerazioni Anatomiche, Fisiologiche, Patologiche e Chirurgiche lntorno la Milza," in "Giornale Veneto di Scienze Mediche," Venice, 1848; (11) "Sulla Frattura del Collo del Femure," ib. 1855; (12) "Sull' Ernia dell' Intestino Cieco," ib. 1860; "Casi Pratici ed Osservazioni di Clinica Chirurgica," in "Atti del Reale Istituto Veneto," vii., viii., Venice, 1862-65; "Sulla Piemia," in "Giornale Veneto di Scienze Mediche," Venice, 1867-68. In addition to his medical studies and practise he devoted himself to classic literature, and at times published essays, especially on Horace and Dante. Pagel, Biographisches Lexicon Hervorragender Aerzte des Neunzehnten Jahrhunderts, s.v., Vienna, 1901.